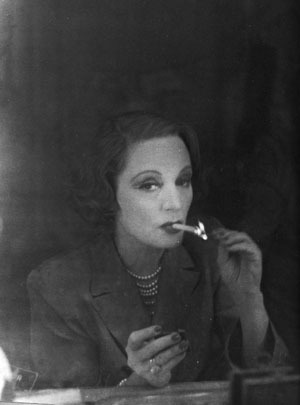 Tallulah Bankhead is memorable in theatre history for a series of characters she created on stage that others translated to film (e.g. Regina in The Little Foxes portrayed by Bette Davis on film) and for characterizations crafted by someone else on film Bankhead argued stole from her personality and mannerisms (Davis again, Margo Channing in All About Eve), and on film for a character who reportedly did not wear undergarments (Connie Porter in Lifeboat). Bankhead hosted and guested on radio and was a gal about town on several continents, and made no apologies for her large living life style — alcohol, drugs of various kinds, men, women, and enjoying herself. There is much to convey about her life and what sense the woman made of it. And this play does not provide that understanding. Looped has been crafted by the same playwright (Matthew Lombardo) who tackled Katharine Hepburn‘s life-as-theatre in Tea at Five. Lombardo clearly has been drawn to larger than life characters, tacking drama onto real life pivot points. For Hepburn in each of two acts two different such events — Act One the dire state of her film career before her pal writes for her the playscript for Philadelphia Story and Act Two resisting then succumbing to the entries of Warren Beatty to appear in his remake of Love Affair (the second remake, after An Affair to Remember). 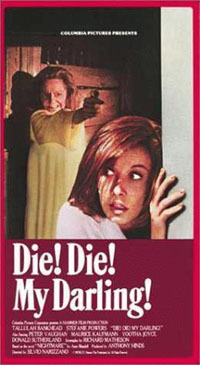 In Looped Lombardo tweaks his method slightly to focus on a single small event in Bankhead’s life — looping some dialog in 1965 in what was to be her last movie, a schlock fest entitled Die! Die! My Darling!. In what may have been based on notes taken during this real looping adventure or may be directly out of Lombardo’s imagination, Bankhead (Valerie Harper) and two other characters — a hapless film editor Danny (Brian Hutchison) who is the last man standing and has to bring in this looped dialog to finish the picture and a competent sound engineer Steve (Michael Mulheren) — spend the better part of a day talking, avoiding, insisting, disclosing, acting out, taking drugs, drinking, smoking. And in the end, it feels like a manipulation. Yes, the performances are honed and these actors are fine. Yes, the set (by Adrian W. Jones) is fun to look at and little moments of slapstick entertain. And yes, as with Tea at Five in which familiar lines of a familiar public character are jumbled together to create fiction, one feels this happening with this play. Moreover, Bankhead one liners that are squished into dialog for her to deliver with a prance and a gesturing hand and a stretch for effect, eyebrow penciled visage, create laugh lines but in the end feel like a hollow shell. Harper as Bankhead delivers a line that ends with describing meeting men who want to “be her”. In fact, this performance feels as though Harper were directed to be just that drag queen version of Bankhead. When our film editor Danny discloses the drama of his life unfolding this same day (a daughter he has never known has decided not to visit, and he discloses his homosexuality and what it has cost him to come out of the closet), we feel a bit for him. But this becomes then Danny’s play not Tallulah’s play, and her life advice to him to live life now rather than repress himself seems … contrived. My matinée audience enthused over this production. A standing ovation during one of the final performances after a closing notice was announced earlier in the week. I am uncertain whether the audience around me was cheering the performers who were soon to be seeking other engagements or cheering the play itself. I want greater veracity if watching a slice of life. I want to understand more intensely a character as outsized as Bankhead’s before she withdraws into a nurturing, advice giving, I’ve-been-there-don’t-waste-your-life kind of mouthpiece. I saw the drag queen treatment of marvelous Tallulah but not any deep understanding of why she was who she was other than single moments of tearful “I was never able to have children” disclosures (oh please) and having a father who didn’t love her. And we were allowed to know Danny the gay film editor with more depth, with more nuance, with more sympathy, in the end. This becomes Danny’s play. And it’s not enough.